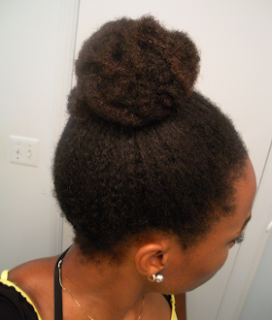 Bun on stretched wash-n-go or reverted twist-out. (I can't remember). 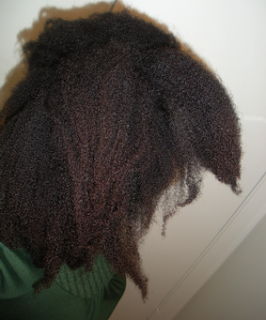 So after a few months of wash-n-gos, braid-outs, and twist-outs, I miss protective styling. While those few months were enjoyable for the most part, the constant manipulation was 1) a daily high maintenance task for a low maintenance gal like me and 2) did not allow for me to retain growth ... which is no surprise. As I mentioned in an earlier post, my focus was to play more with my hair at its current length even if it met not retaining length. 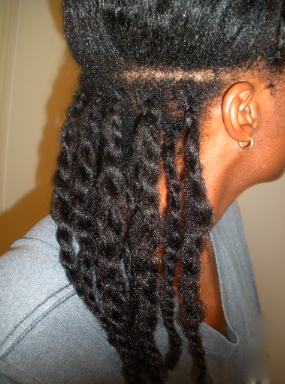 Well now that phase is over and I am back to my trusty length retention regimen - twists. However, there will be a few adjustments since getting to waistlength is one thing but getting to hip-length is a whole other hurdle. I will talk more about those adjustments in a future post. As for my new way of air-drying? Well, it is roller sets. I like them because they are quick and easy to do, dry fully overnight, require less manipulation, and get my hair more stretched than twists or braids. 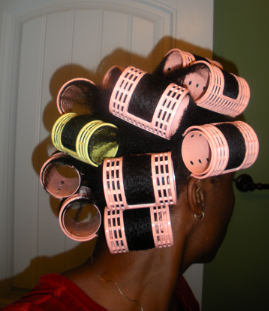 So that is one of the changes I am making to my regimen -- air-drying my hair via rollers instead of twists/braids. 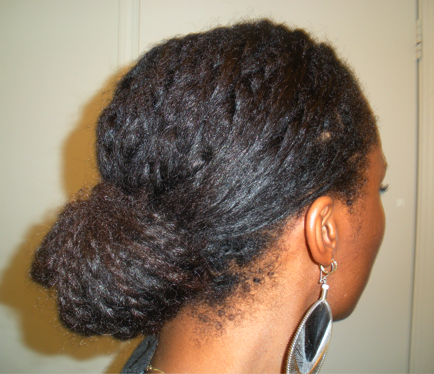 Dried wash-n-go into a puff. 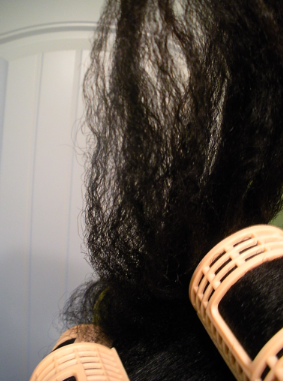 Stretched wash-n-go (via braids that I did not allow to dry all the way). First blow out in years. 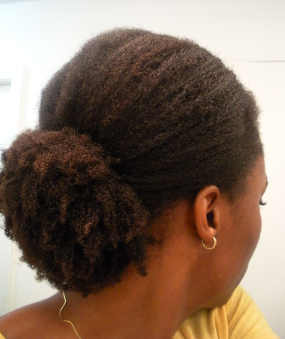 Wasn't impressed with the result (especially the shrunken ends and the minimal overall stretch). Hence, I will stick to other options for stretching my hair. 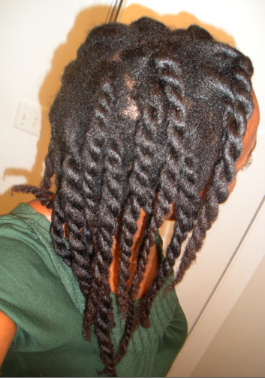 Jumbo twists on semi-flat ironed hair (300 deg F). I was attempting to try a modified version of the Mahoganycurls' twist out tutorial but the weather (i.e., humidity and rain) wouldn't allow for it. 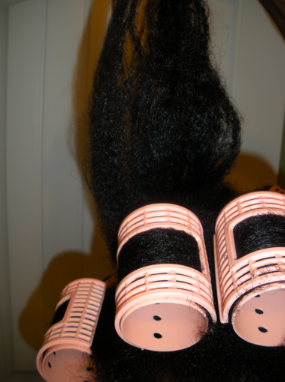 Air drying in rollers to stretch my hair. Close-up of the result. I like. Experimenting with loose twists for the first time (on a failed flat iron job). Though a few youtubers have done this style before, I was inspired by MsTanish because her hair characteristics are closest to mine. Loose twists in a bun. I have to try air drying overnight with rollers. I'll be washing and deep conditioning my hair tomorrow night in preparation for installation of marley braids the next night. This should be interesting. I'll update my blog with the final results. 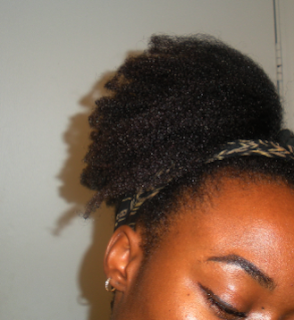 Just checked out the twist-out on your blog ... Lovely hair! Thanks for visiting my blog. I tried the roller set stretch and I am in LOVE! Thank you for this idea. I didn't post the pics to my blog after all.